"An assault on the state of the speaker art that honors the music." ...A more relevant face-off for admirers of the TIDAL sound is between the Sunrays and the Contriva Diacera SEs, which I reviewed more than a year ago. I expected that the Sunrays would be more accomplished than their smaller, less expensive brethren, owing to the ambition of their design, their sheer size and their driver complement, but their performance was significantly better in every way. ...After spending months with the Sunrays, I get it. 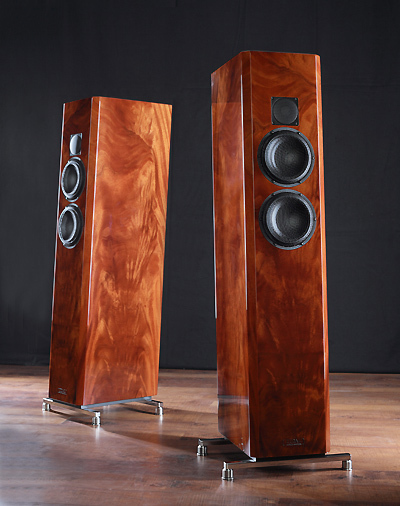 These are uniquely revealing and musical speakers whose spatial characteristics and tonal sophistication befit their stature and unusual design. More than enjoying the Sunrays, I valued them as an alternative to so many big, expensive speakers whose promise goes unrealized for one reason or another. 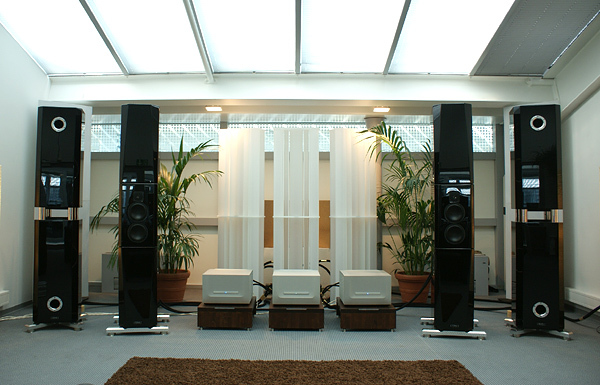 The TIDAL Sunray was one of the 'headliner' at this years Park Aveny High End Show in Göteborg. It was displayed fully active with 2 x Burmester 911 power amps, TIDAL Preos preamplifier and the TIDAL LPX active crossover. "...What struck me first was, this is a sublime sculpture, big yes but still elegant and fit'n finish to die for. Extreeeemly good looking. I understand more now what you mean about these speakers or music messenger. Especially the bass were like nothing else. Spread all ower the room with very litle bass-modes. The soundstage was big and pointing out the musicians thruthfully in shape and hight. (without any oversizing)." Another setup was the TIDAL Contriva Diacera, all driven by Accuphase electronics. 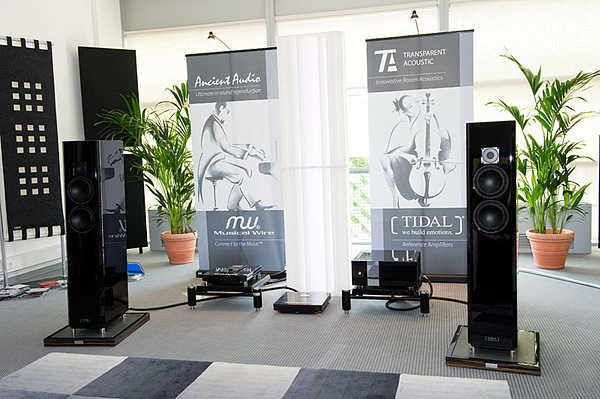 One of the Best Sounding rooms at this year's event goes to the TIDAL Piano Cera loudspeakers, Presos preamp and Impact amplifier. Digital playback was by way of a dCS Puccini/UClock combo and the overall sonic effect was refined, smooth and ultra-musical. In a word: EASY. ...The Piano Cera is not only a very musical loudspeaker, but the same time also an instrument to judge the quality of the recording itself. This means, if the musical content and expression itself is alright, then the TIDAL's will transport this to 100%, without hiding the flaws of the record. ... I lost myself in descriptions of music, even if this review is supposed to be about a loudspeaker, why is that? Well, this is the biggest compliment I can give any loudspeaker. It is all about the fun of music, and not only about "locating the triangle at tact 37, two meters behind the timpany-guy in perfect timing every second beat". And exactly for that is the Piano Cera the right musical instrument! 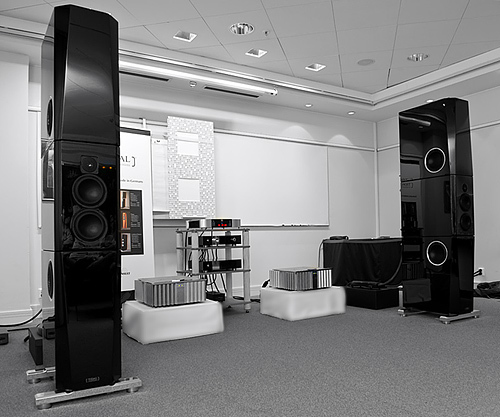 Don't forget: you can hear all details and for sure the mentioned triangle we talked about, you can locate it even to the millimeter, but the physical presence of the speaker itself is completely invisible and does stand completely behind the musical interpretation - this is the big strength of the TIDAL's. The owner of the Piano Cera will in most cases close the chapter "loudspeaker", because with its flexible room adaption for almost all rooms - whether small or bigger ones - this transducer let speak the music itself. "... 'The Voice That Is' is the name of a Newtown Square, PA, retailer and when I walked into their room, I had no idea what equipment I was listening to, as it was - again - totally dark! But the music playing, Stevie Ray Vaughan's "Tin Pan Alley," took me back a quarter century, when all you heard at audio shows was this cut. But it never sounded this good back then! As my eyes accommodated to the darkness, I could make two pairs of TIDAL speakers, the floorstanding Piano Diaceras behind stand-mounted Ameas. 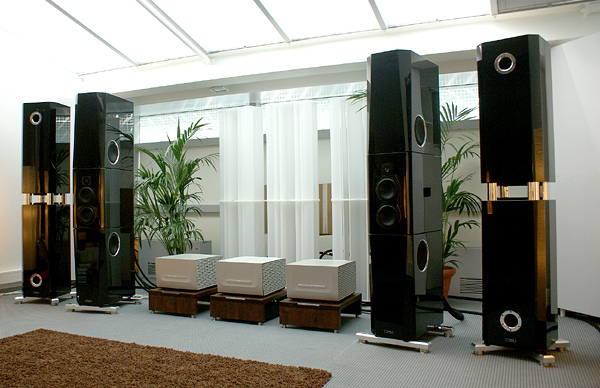 Both feature ceramic-cone woofers and a diamond-dome tweeter but it was the Diaceras that were playing,connected with Argento cable to a TIDAL Impact 140Wpc stereo amplifier and a TIDAL Preas preamp. Source was a MacBook Pro feeding USB data to a dCS Debussy D/A. As if to confirm that it was 1987, the next track played was "Le temps passé" from the Michel Jonasz CD L'Histoire de Monsieur Swing. This is what I am talking about - a huge, stable soundstage, extending way beyond the speaker positions; smooth, grain-free highs, tight, tuneful, deep lows, and a pure, coloration-free midrange - and all of this in service of the music, adding to the experience instead of substituting for it. It doesn't get much better than this!" ...the decor, setup and gear were spectacular. The sound quality? Absurdly good. Doug White, president of The Voice That Is, totally hit it out of the park with this setup. The look and feel of this unit, and the matching Impact stereo amp, were truly bespoke. Every exposed surface gleamed piano-black or liquid silver. This is some seriously upscale gear and quite easily ran away with the CAF 2011 Beauty Contest crown. All TIDAL speakers feature custom-made-for-TIDAL Accuton drivers that were neither cold nor harsh (a criticism I’ve heard about ceramic drivers generally but still have yet to actually hear in person) but very linear and totally neutral. While both speakers had a very full sound, the most arresting thing was how they nailed up a sound stage that had pin-point imaging and crystal-clear sonics. Ever heard how reviewers will trot out the cliche about how a given component provides “an open window on the music?”. Well, the sound in the TIDAL room is going to make me dig up another one: “What happened to the window?”. The TIDAL Piano Cera is one terrific-sounding loudspeaker. It’s transparent and quick, and plays with more weight and depth in the bass than you would ever suspect from a glance at its driver array. In fact, looking at this speaker either on paper or in photos will give you no hint of the performance lurking beneath its rather simple but elegant appearance. There is a ton of clever engineering inside, and that technical expertise translates into audible results. I think the TIDAL Piano Cera would be a great choice for someone with a midsize room who doesn’t need a speaker that makes a "statement" -- except when it’s playing music." 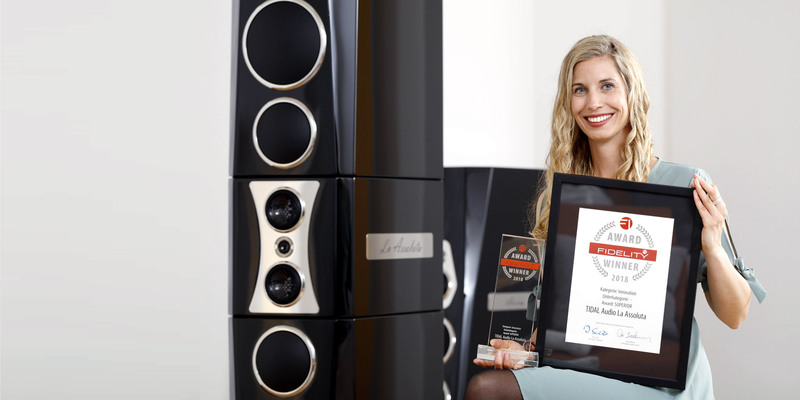 "German speaker company TIDAL and Constellation Audio of the USA teamed up to produce an absolutely stellar sound at this year's show. 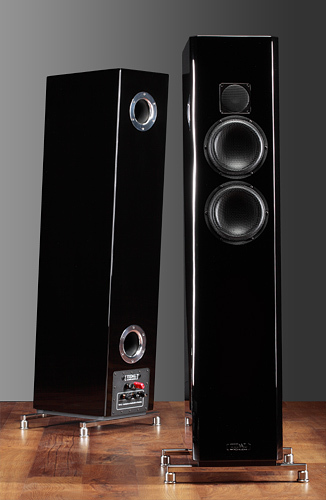 The TIDAL T1 double-stacked loudspeaker represents designer Jörn Janczak's best. 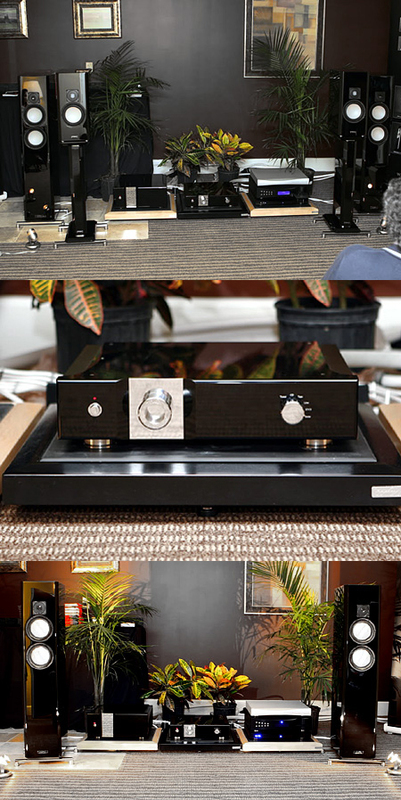 Constellation Audio boasts a look and feel that is as wonderful as its sound. This is my first time writing on these electronics because it's really also my first time hearing them. If these pictures don't provide you enough...here's a short video I took also here. " "Priced at 15.500 € per pair, the Piano Cera shrouds its sonic prowess in piano-black lacquer of a quality that is quite uncommon. In fact, the slim proportions easily conceal that this is a 117-pound speaker built quite heroically. 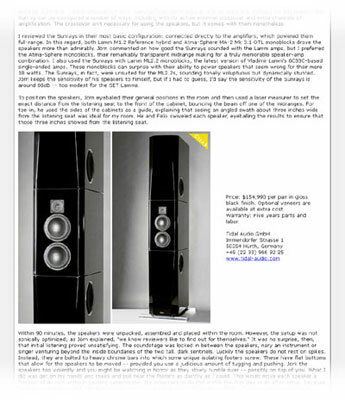 Even still, there are no exotic cabinet materials and the drivers are made to TIDAL's specs by Accuton, another German firm. That description doesn't sound state of the art. When it plays music, though, is when you begin to understand that this is no plain-Jane loudspeaker. With bass articulation and weight that belie its modest proportions and coherence that is nigh-on perfect, the TIDAL Piano Cera is a stark reminder that the underlying design -- not the cosmetic flourishes or the story -- is ultimately what is key to sound quality. 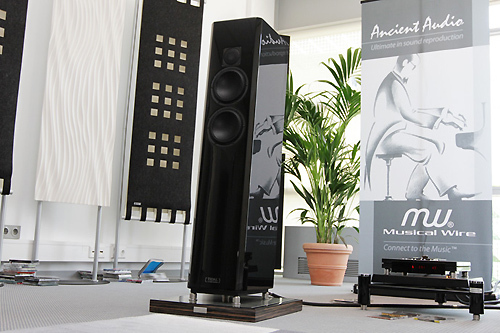 The Piano Cera isn't just different from most other speakers I heard at High End 2011; it's better." "Visiting the TIDAL room was like taking a bath in music - this describes it the best! One had much better mood when leaving the room then one had when entering it...". Voted as one of the Best Sound of Show 2011. 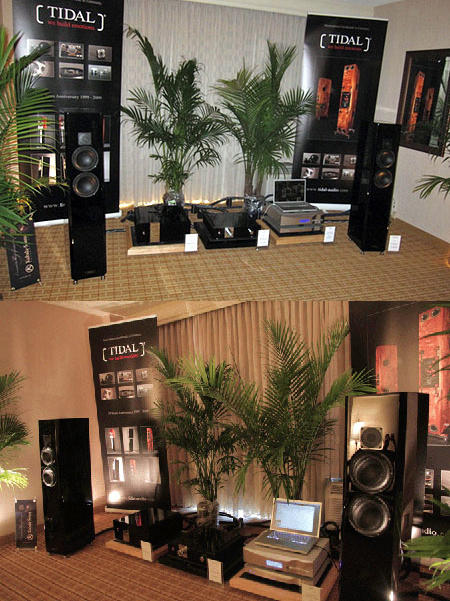 "...my clear favorite was the collaboration between Ancient Audio, TIDAL and Musical Wire with the smaller TIDAL speakers organized by Dmitry Valdin of Transparent Acoustic whose banner-type room treatments graced the room's sidewalls."